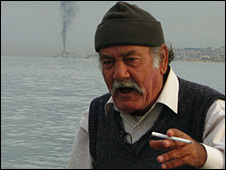 A nauseating stench fills the air almost as soon as the boat turns south, leaving behind the ancient harbour of Sidon. "It's horrible isn't it? You smell it before you can see it," Mohammad, a fisherman, said as he steers the vessel. It takes another 10 minutes for the source of the stench to appear- a giant mountain of rubbish, as tall as a four floor building. It seems to rise out of the sea. The Sidon rubbish dump has been growing for almost 30 years. Environmental campaigners in Lebanon say the government must solve what they say is a catastrophe for the local ecosystem. It is also a disaster for Mohammad and his fellow fishermen. Mohammad blames the rubbish mountain for his thinning catches and says the waste gets caught in his fishing nets. "A set of nets costs about US$500," he said. "We keep losing our nets, and we don't have money to replace them. The government is doing nothing about this." The dump, set right next to the ruins of an old Jewish cemetery, towers over the city of Sidon. It was originally created to dispose of the remains of buildings destroyed in Israeli airstrikes during the 1982 invasion. But ever since it has served as the main disposal site for the city. Every day lorries carry rubbish to the top of the hill, where they are greeted by a group of a dozen or so men and a few packs of dogs which live at the dump. 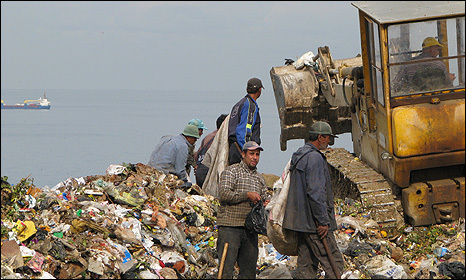 The scavengers, most of whom are Palestinian refugees, sort the rubbish, picking out anything they can sell on. "Metal, plastic, glass is what we look for," said Mohammad Hamdan, a 30-year-old scavenger. He has worked at the dump since he was 10 years old and says he makes about US$10 dollars a day. "Some of us here are well-educated, some even have university degrees, but there are no jobs for us in Lebanon," Mr Hamdan said. He says he hates his job, but believes that the only alternative to it is begging. "You can never get used to the smell. And in the summer, when its hot, the stench is just unbearable," said Mr Hamdan. Environmentalists say that along with the smell, the dump is a health hazard. Industrial, some chemical and even medical waste is dumped at the site along with household rubbish. Men who work at the site say hospitals from the area regularly bring their rubbish to the dump. "Its full of syringes, blood, flesh, even kidneys," Mr Hamdan cringes as he describes the hospital waste. Much of it ends up in the Mediterranean sea. The dump is sliding into the water. Even though there there have been no comprehensive studies on its effect to humans and marine life, environmentalists insists that it is damaging. "Toxins that are leaking into the sea pose a threat to the marine life, and to the eco-system along the Mediterranean coast," said Garabed Kazanjian, oceans campaigner for Greenpeace. Mr Kazanjian says it is possible to solve the problem. A plan for moving the site has been worked out and there are donor funds available. But there is a lack of political will. For years, Lebanon's divisive sectarian politics have stood in the way of removing the dump. Various government agencies blame each other for the problem, each refusing to take charge. "The plan is in place, money is there, the only thing that's missing is a political decision. But until these politicians start thinking about the benefit of people and the ecosystem, this issue will not be solved," says Mr Kazanjian.